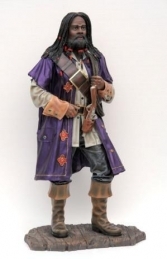 This stunning life-size and life-like replica Pirate figure in the style of the infamous Pirate Captain Jack Sparrow will make a fantastic addition to any Pirates of the Carribean themed area. 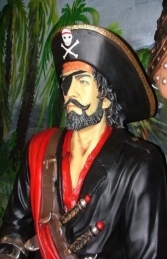 This life-size model of Captain Jack drinking from a beer tankard with his foot resting on a replica barrel is a stunning resin statue ideal for using in any Caribbean Pirate themed area. The detail of the costume on this figure is really impressive.